NEW YORK CITY The first lesson I learned upon arrival: If you don't drive your own car, ONLY take a metered cab from the airport. Any other driver, no matter how polite, is there to rip you off. Naturally, I learned this lesson the hard way. And, if you have time, it's even cheaper to take one of the mini bus rides. Finally, if you don't have much luggage, you can easily navigate the metro as well. Every time I go to New York, I know I need to come back again. There is so much to see and I spend hours and hours every day walking. And if you can see the City at Christmas, there just isn't any other place like it. There are the usual "must see" things to visit. The Empire State Building, the Chrylser Building, the High Line Park and the MOMA top my list. Of course, most people who visit New York must also go to Times Square, the Statue of Liberty, Ellis Island, Central Park, Rockefeller Center with an NBC tour and Ground Zero. For me, it was imperative to see some kind of play on or off Broadway. It's therapy. Don't buy full price tickets at the theater! It is possible to get rush tickets (limited discount seats), but you have to go early to the theaters and know what you are doing. The salvation for many a theater goer is TKTS. They sell half price tickets for performances that day. Not all shows are available but generally there is enough to give you a choice. Most people buy them at the office on Times Square. Shhhhh! Get them at a fraction of the time at the South Seaport! Shhhh! Check out Useful Address Information. You can get tickets in advance online, but shop around because prices really vary. I have loved every show I have seen. My list includes STOMP, The Fantasticks, The Altar Boyz, RENT, and my personal favorite - The 25th Annual Putnam County Spelling Bee. Looking for free entertainment? 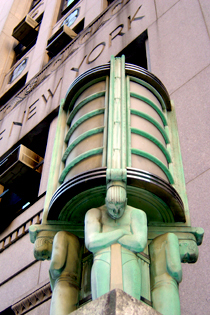 Walking the city is a great idea, especially if you are interested in Art Deco. Even if you aren't allowed in the Chrysler Building beyond the entrance, it is worth it! There are all sorts of neighborhoods to explore. Most of them, I'd heard of all my life, but now I know what places like Greenwich Village, Chelsea, the Financial District, Midtown, the Lower East Side, Chinatown and Little Italy really look like. And as long as free is in your price range, take the ferry to Staten Island. Not everything is free, but some things are worth every penny you have to spend. Viewing the Statue of Liberty up close, exploring the city from the top of the Empire State Building, visiting museums such as the Titanic exhibition and the Tenement Museum, as well as standing mere inches from Van Gogh's Starry Night at the MOMA are some of life's priceless moments -- even if they come with a price. Copyright 2015 by Phillip Martin All rights reserved.